One of my favorite recipes that I wrote for my old food column in the now-defunct Cosmo for Latinas magazine (R.I.P. 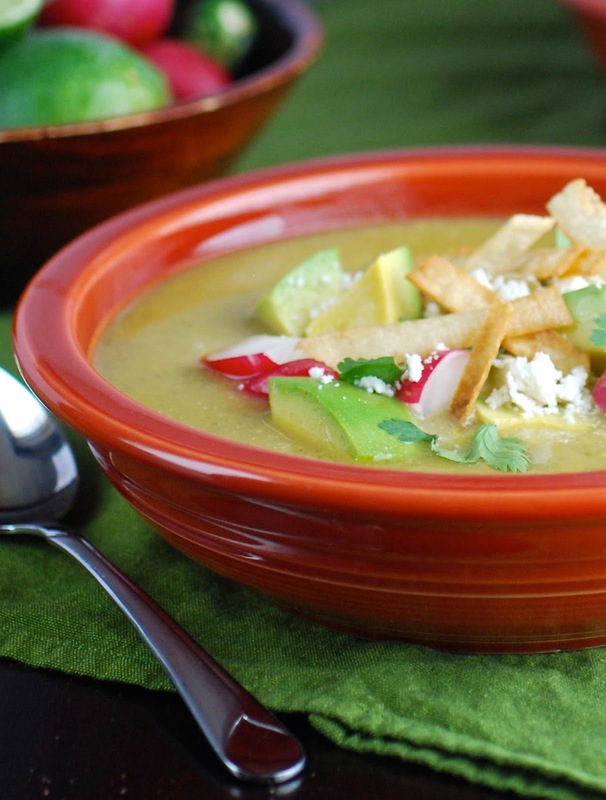 ), was this vegetarian pozole verde recipe. Pozole is one of those things that seems like it would take days to make, but is actually quite simple. Just roast some chilies, tomatillos for a few minutes then puree with some fresh herbs and spices. The key ingredient in this spicy stew is hominy—giant, chewy kernels of dried corn that taste like a cross between popcorn and tortilla chips. The hominy is prepared the same way beans are, and just like with beans, can use either canned or dried versions to make it. The most fun thing about pozole is the toppings. 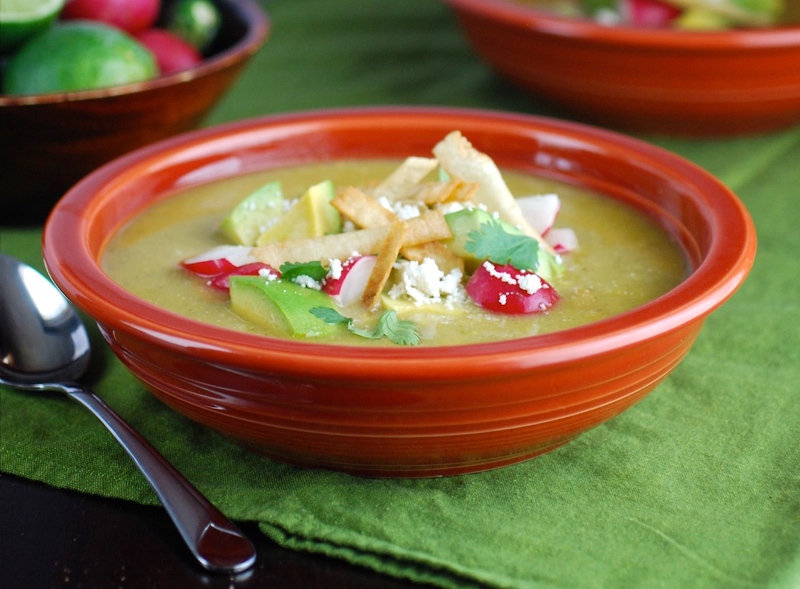 Serve the soup along with bowl of things like diced avocado, fresh cilantro, pickled or raw red onions, crumbled cheese, lime wedges, and crunchy sliced radish or jicama. If you prefer, you can also add pulled rotisserie or leftover chicken, poached shrimp, scallops, or other proteins, though obviously that would make it not-vegetarian anymore. Remove husks from tomatillos and rinse. Combine tomatillos and jalapenos in a small saucepan, cover with water, and bring to a boil. Simmer for 5 minutes or until tomatillos turn pale green and tender. Remove with a slotted spoon and transfer to a food processor or blender. Add the epazote or cilantro leaves, garlic, onion, salt, and black pepper, and puree until smooth. Heat 2 tablespoons olive oil in a skillet over medium heat and add the pureed sauce. Simmer for 10 minutes, stirring until sauce thickens and darkens in color. Remove from heat and set aside. Combine vegetable broth and rinsed hominy in a large pot and bring to a boil. Stir in all the tomatillo sauce. Taste and adjust seasoning with salt and pepper, if desired. .